the company’s success to the loyalty of longtime employees, who bring critical skills to the business. In the view of Devin and Allison Cooper, nursery ownership is a lifestyle — one that they love. 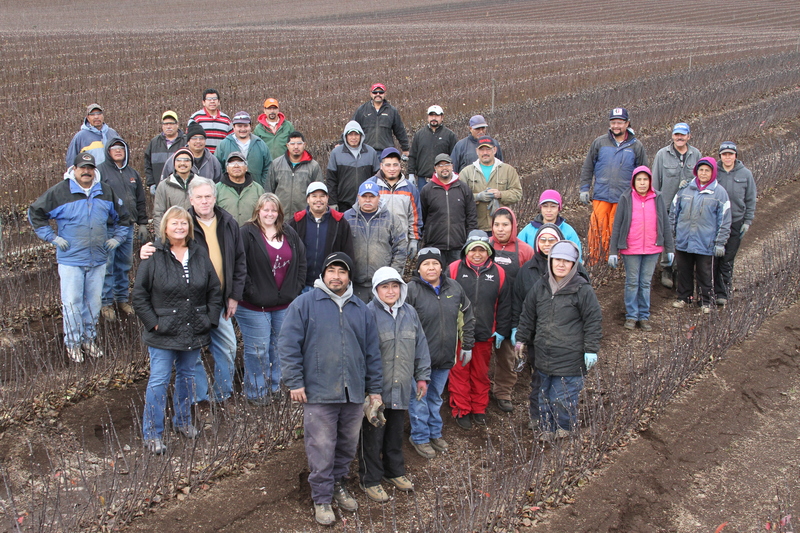 For more than 20 years, the Coopers have owned Willamette Nurseries. They grow seedlings and rootstock for fruit and shade trees on two farms, which include 150 acres of outdoor space, plus 24,000 square feet of greenhouse space. Like most people, the Coopers become exceptionally busy right after Thanksgiving, but the holiday season has little to do with it. December is when they begin to harvest their rootstock and seedlings, and when their customers begin ordering material for the coming shipping season. Customer care becomes an all-day effort, especially considering that the Coopers sell most of their material themselves (a small amount is sold by broker). The Coopers do everything they can to provide a consistent supply of product, because they know customers are counting on them. They also guarantee everything they sell. This service-first approach also includes working with customers on freight. Fact is, the Coopers work closely with customers on every aspect of the sale. 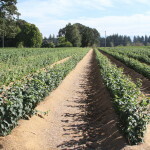 Willamette Nurseries propagates nursery fruit tree rootstock using a specialized method known as stool beds, which use mother plants in mounded rows. Family members Alex, Devin and Allison Cooper are all involved in the day-to-day management of family-owned Willamette Nurseries in Canby, Oregon. 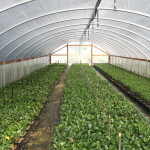 Production greenhouse at a Willamette Nurseries farm near Hubbard, Oregon. Devin and Allison didn’t set out to be nursery people. Devin was a manufacturing engineer for Kenworth Truck in the Seattle area, and Allison was a stockbroker for Prudential Securities. However, they decided to find work that would allow a more family-oriented lifestyle. And as they began to explore other career options, they became aware of a business opportunity in Canby, Oregon. They agreed to purchase the rootstock operation from Glen Arneson in 1992, renaming it Willamette Nurseries. “We didn’t really know anything about growing plants,” Devin said. The Coopers learned how the nursery’s fruit tree rootstock was raised in stool beds, which are a very specialized form of production. The stool beds are comprised of mother plants planted in rows in the ground. Each year the mother plants are cut back to ground level. Then as the plants push out new shoots, sawdust is brought around the base of the plants as they grow. The mother plant pushes secondary roots into the sawdust. When these roots are sufficiently developed, they can be harvested as rootstock from the mother plant. Typically, it takes about four years before a new stool bed comes into full production. The bed can produce saleable rootstock for around 20 years. winters are a big advantage for this type of production. Glen stayed on for one year to help with the transition, which was key. But even more importantly, the Coopers earned the loyalty of longtime employees who had worked for the Arnesons, in particular their two supervisors, Rafael Arellano and Jorge Perez. Rafael and Jorge, along with other key workers, stayed on under the new ownership. The Coopers also relied on knowledge from fellow growers. This was particularly important for the highly specialized areas of fruit trees and rootstock. In many industries, it is unheard of for competitors to share information, but in the Oregon nursery industry, it is commonplace. Since taking over, the Coopers have evolved their business. They have also applied their own skills from prior careers. Devin’s experience with manufacturing processes has helped the nursery become more efficient, and Allison’s skills have transferred to the sales and marketing tasks she performs daily. Both also had a rich understanding of customer relationships. During their first decade of ownership, one of their key decisions was to travel frequently and get to know their customers and their unique needs. In the early days, the nursery sold primarily to fruit tree nurseries, plus a few orchardists that wanted to grow their own trees but buy in their rootstock. There were also customers along the West Coast, New York and Missouri, as well as other markets. Willamette Nurseries gradually expanded its offerings, often in response to requests from customers. In the late 1990s, the nursery added cherry and pear rootstocks that could be used for both ornamental purposes and fruit production. This necessitated a major expansion. 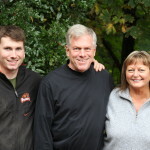 The Coopers purchased a second, 33-acre farm near Hubbard, Oregon, in 1999. Here, they also added shadehouses to produce cuttings and container-grown seedlings. Around 2002, the demand for apple rootstock dropped, so the Coopers shifted some of their production to other seedling rootstocks such as Cercis canadensis, Acer saccharum and Zelkova serrata, as well as additional fruit and flowering tree understocks. In 2007, the Coopers expanded the Hubbard farm by purchasing an additional 100 acres, allowing for a large increase in seedling production. A year or two later, they brought in propagator Steve Gilmer to help with that effort. Steve brought more than 20 years of propagation experience. He took charge of cutting and container-grown seedling production grown in shadehouses. For Willamette Nurseries, growing seedlings and rootstock for both ornamental purposes and orchard production has been a sound strategy. When demand for fruit trees has gone down, typically the demand for ornamentals has risen, and vice versa. For the past five years, demand for apples has been strong, while demand for ornamentals has been weak, but as the Coopers predicted, that is beginning to change again.“We’re hearing from customers, ‘I might have a bigger order this year,’” Allison said. For the past two years, the Coopers have enjoyed having their son Alex on board. The Oregon State University graduate came to work at the nursery in 2012. Prior to that, he worked in an industry that Oregon is equally well known for — breweries and distilleries. In response to this industry’s demand for qualified professionals, OSU began offering food science degrees with a specialization in fermentation science, and it is with this degree that Alex graduated in 2009. While in school he brewed for the McMenamins Edgefield brewpub in the summertime, and after earning his degree, he worked for Clear Creek Distillery in downtown Portland, renowned for its fine whiskey, fruit brandies and liqueurs. These were satisfying jobs, but like his parents before him, he heard the call of the nursery lifestyle. For the past two years, Alex has been spending time learning every aspect of how Willamette Nurseries operates. In all, coming home to the nursery has been a good experience for Alex — one made easier thanks to the nursery’s longtime employees. “When I returned to the nursery, I hadn’t expected to see so many of the same people still working there,” he said, “but it makes sense.” After all, as Alex’s parents would no doubt confirm, it’s the employees who have made the business successful. Over the years, the number of full-time employees has grown, as has the number of months that seasonal employees are needed. In fact, “seasonal employee” might be a bit of a misnomer at Willamette Nurseries, as many work 10 months out of the year. Providing more steady work for the employees has been one of Devin’s goals and one of the drivers for diversification of the product line. “It’s just good business sense to try and hang on to good people,” he said.